Last Friday, I and NIH Deputy Director for Extramural Research Dr. Sally Rockey visited the NYU Langone Medical Center in New York City. We were there to see what NIH could do to try to help the biomedical researchers whose work has been disrupted—and laboratories devastated—by Superstorm Sandy, which slammed into the Northeast coast about a month ago. The force of the water blew metal doors open and destroyed years worth of experiments. From what we saw during our visit, I can tell you the damage is truly appalling. The violent surge of water from the East River at 31st Street topped all predictions and came with great swiftness, bursting through concrete walls and blowing open iron doors. The lab animal facility was quickly submerged, and thousands of valuable mice and rats were lost. Central facilities for electrical power and heating in an older building were severely damaged; this will take many months to repair since the flood also exposed vast amounts of asbestos. We met with NYU leadership in a chilly conference room to learn of their 24/7 efforts to respond to this unprecedented disaster. 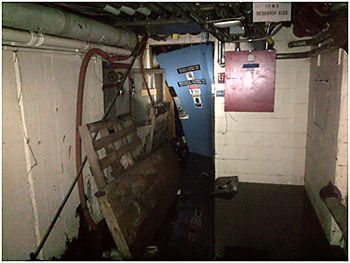 Then, we toured some of the labs that are unusable because the infrastructure has been essentially obliterated. Dr. Rockey and I also met with faculty, staff, and postdocs in a town meeting and expressed our solidarity with this beleaguered community. We promised to use all available tools from NIH to help: altering submission deadlines for grant applications, allowing researchers to negotiate new specific aims, and extending training periods for trainees whose research projects have been seriously affected. Soon, NIH will issue an opportunity for NYU researchers who have lost precious equipment or supplies to apply for additional funding through Administrative Supplements. My hat is off to NYU Langone’s Chief Scientific Officer Dr. Dafna Bar-Sagi and her colleagues for leading the recovery effort. They are engaged in a heroic endeavor that will extend over many months, possibly years, as they construct a new animal facility. While the road ahead is long, there is no doubt from what we saw on Friday that the scientists at NYU are determined and resilient. All of us should do whatever we can to help this vital part of our nation’s biomedical research community during these terribly difficult circumstances.